Alcatel-Lucent offers a wide range of smart networking devices, and one of its more impressive fiber products is the 7330 Intelligent Services Access Manager. 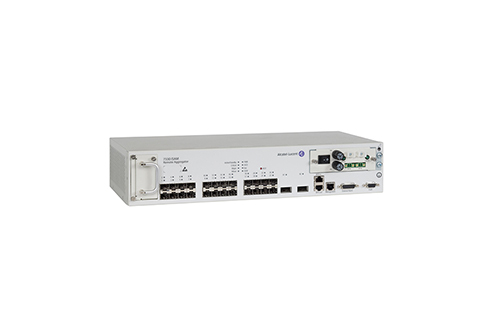 The Alcatel-Lucent 7330 ISAM is a 19-inch full-service IP access node for cabinets and small central offices, making it a vital part of any Fiber-to-the-Node deployment. If you are working on a smart, strong triple-play offering for your subscribers, this is likely the compact ISAM you need. Refurbished Alcatel-Lucent 7330 ISAM models can provide extremely fast high-speed broadband services over copper as VDSL2 and multi-DSL or active Ethernet fiber. Its high-density yet flexible shelf supports up to 10 DSL, P2P fiber, splitter and voice line card slot, and it can serve as many as 480 subscribers. Remote expansion modules are available to bring your high-quality video and voice services to a platform that supports mobile backhauling and other business-grade features. The 2007 model still maintains its “5 nines” compliance. Used and refurbished Alcatel-Lucent 7330 ISAM units from Worldwide Supply offer support for today’s very high-speed broadband deployments over DSL and fiber, with significant IPTV capabilities and a cost-effective platform for modernizing voice. Each unit offers new line cards that include 48p VDSL2 and 16p active Ethernet. Its integrated VoIP Access Gateway also supports the ISAM voice package on other Alcatel-Lucent gear. You’ll also get 2.5 Gbit backplane with front cabling for LTs. Worldwide Supply provides a comprehensive lineup of Alcatel-Lucent 7330 ISAMs plus the parts and service you need to keep yours running strong. Give your network the strength it needs with the right service access management tools. Worldwide Supply stocks a complete lineup of Alcatel-Lucent 7330 ISAM FTTN managers. These compact, full-service solutions are a smart choice for networks of all shapes and sizes. While the price point is strong on its own, we offer a chance for your network to save even more with used and refurbished options. A used Alcatel-Lucent 7330 ISAM from us comes with all the same reliability and performance promises as a new model, but up to 80% off the standard OEM price. Our technicians review each model thoroughly, repair and upgrade any issues and then put the whole thing through a series of real-world tests in our in-house facility. Once we are sure of the quality, we add a lifetime warranty and present them to you for greater savings. To ensure that a refurbished Alcatel-Lucent 7330 ISAM continues to perform optimally, we also provide a NetGuard maintenance package. This solution covers more than 200 product families from dozens of OEMs under a single contract. By remaining platform and provider neutral, you no longer need to meet upgrade demands or rush around to multiple contacts and service departments when your network has an issue. We’re your one call to keep things going strong, with 24/7 expert support and parts and replacements that ship as fast as the same day in many locations. Find the perfect new or used Alcatel-Lucent 7330 ISAM below and then browse our maintenance solution to see how you can protect your entire network and your budget.